Ten weeks ago, I gave birth to my second child, a boy. We are told in so many ways that birth and motherhood should be blissful, perfect, happy, wonderful. Or that birth is going to be a medical emergency and a nightmare. In reality they are both positive and negative all wrapped into one. The journey of birth is a passage between worlds, a glimpse of a bigger universe, and a closeness to life and death. In processing this experience it is so important to tell your story, over and over, in as many ways as possible, as it evolves over the coming months. But tell it to carefully chosen people whom you trust, empathetic listeners who will see you for the powerful mama you are, in your moments of confusion and fear as well as those of power and intensity. I write these words holding my sister in my heart, whose baby boy was born yesterday morning. I am waiting and hopeful to hear her story, soon. Birth and motherhood bring us the unexpected every day. Wise women have said that being flexible and open to changes in plan are key. I feel extremely fortunate that my son’s birth, while not being exactly what I expected, turned out to be exactly the right birth for him and one that met my hopes and my goals. You can plan and prepare in so many ways and still have a birth journey that doesn’t quite go your way. But I believe that the ways I prepared for this birth made a significant difference in helping me to have an empowering experience, growing stronger as a woman and a mother. That’s why I want to share the resources I drew upon, not that they guarantee a smooth birth experience but because they might give other women ideas for much-needed support. Please read this post for those details. My son’s birth was long and gradual in the planning and preparation — months of preparing and meditating, a week of early labor — but extremely fast in the end. Just a few short hours of active labor and he was here. Here it is, my new baby’s birth story. During my 39th week of pregnancy I started to feel contractions at night, but they would always go away by morning (or when my toddler woke up in the night). During the day I was getting spacier and more distant, feeling the veil descending, my subconscious mind making an appearance. That Saturday and Sunday I rested as much as possible while my husband took my older daughter out to the park. Then on Monday, two days before my guess date, I had a super physical and intense day at the park myself. We saw so many friends from the neighborhood, children and parents. I shared my spacy, entering-the-veil view of the world with them and felt joy in seeing so many lovely friends. By the end of the day I was exhausted and overwhelmed, from sun and air, running after children, helping a friend with a potty accident. I thought for sure I had done too much. But that night, my nightly contractions came on a bit stronger. I still thought, this must not be it, but I contacted my birth team. I went to bed around 10am, feeling contractions (surges) maybe every 30 minutes, but they didn’t seem to have a strong pattern yet. I lost my mucus plug before I went to sleep. At 12:30am I woke up. I was feeling surges, enough so that I couldn’t sleep, my daughter awoke from the rustling and came into us, and I started calling in my support team. I felt a bit hesitant calling in the middle of the night, still unconvinced that this was “it.” Around 1am I called the mom and friend who my daughter had chosen to be her support friend during the birth. She came over right away, and the two of them played, alert, cheerful, and focused, on a parallel mission of their own in the next room, throughout the night. Next my husband called our midwife and doula. It didn’t seem super urgent yet, so they took their time. Then, my water broke. I was lying in my bed this whole time, on some towels. I felt the liquid and things ramped up quickly. The sensations and surges got super intense. Super super intense. I remember desperately squeezing a pillow in my arms and arching my back, feeling sensation take over every part of me. My husband held my hand tight. I gripped his whole arm, feeling his strength returning to me, keeping me focused and strong. When he tried to step away to bring me something I called him right back, needing him. I blew horselips to ease the intensity, as Ina May Gaskin often recommends for softening. Softening the face and mouth softens all the muscles and sphincters needed to bring the baby down. I felt that my surges were effective; I had a sense that they were making a difference. With my first birth so often the intensity felt like pushing against a brick wall; so much intensity seemingly for nothing! But this time I felt the effectiveness, that something was happening. Movement. I felt that these surges were becoming pushes. Where was my team? I had a moment of panic, thinking, where are they?? Will I be alone in the final moments? I felt the edges of fear creeping in. But my working, laboring, up to the mountain top to bring home my baby, continued on its own. As my midwife said later, if I had been truly afraid, that would have slowed down labor long enough for them to arrive. But I wasn’t. So it didn’t. My husband would have caught the baby if necessary! At 2am my husband called our midwife again to hurry her along. 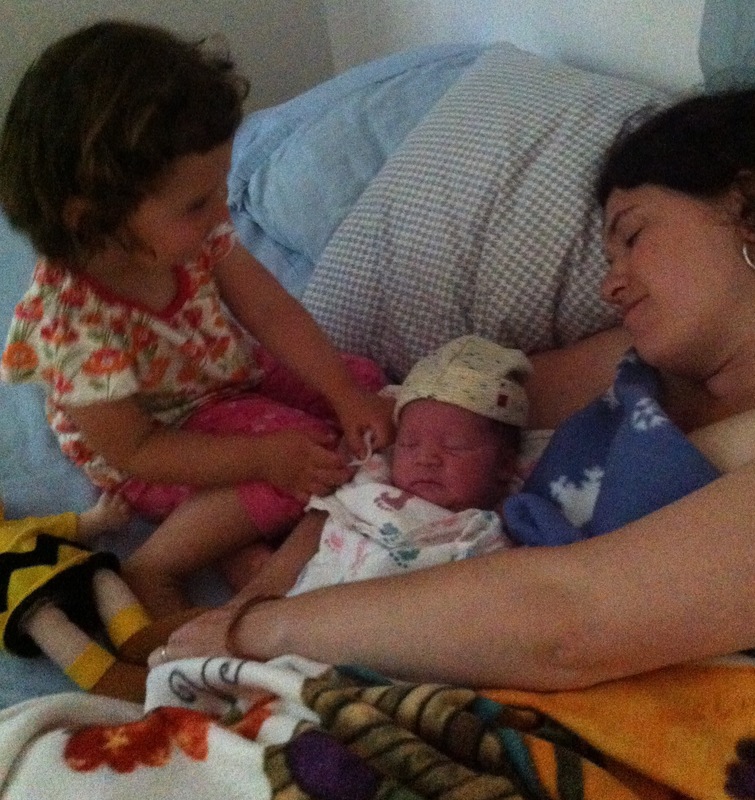 At 2:20am our doula arrived and our midwife plus the second midwife right behind her. I was so glad to have all of them because the doula came right to my side and encouraged me along with my husband. She said, focus your breaths downward. I shifted, focusing my efforts on helping my baby to move. Moving with him. Meanwhile my midwife was setting up her equipment, preparing for my baby’s arrival. Really, they did nothing much to me or for me. They followed my lead and let me continue to labor. Then, I felt a pause. A very short one, but still, a moment of rest. The mountain top. Me and by baby, there together. And then the pushing, the labor, took up again. I felt sure this would go on and on. And how could I maintain this intensity. How could I? Was I in the zone? Was I far enough in my subconscious mind, hormones aiding me to withstand the sensation, to be able to keep this up? A few more surges and my midwife said I could feel his head! What?!? I touched the warm, wet peach in disbelief. Another surge and she said, his head was out! Another, the greatest effort and all my focus, and out he came, onto my own bed in my own home. I heard his cry. He was born at 2:43am. They toweled him off, brusquely like toweling off a wet lamb, stimulating his circulation and breathing. He was crying and his breathing was wet so they gave him a few respirations while I rested. I held onto my husband and rested with myself. I breathed into the universe, grateful. I asked for him. They passed him up to my chest and I yelped, “Baby!” My baby. My heart swelled and flip-flopped and did all those things. All I could see clearly was a dimple on his shoulder as he mewed into my chest. I delivered the placenta, and the midwives wrapped it up cozy and tucked it in next to us, leaving it attached. There was a full knot in his cord, but the cord had an extra thick coating that would have protected him in any case. I was shivering madly, and felt intense afterpains, like super strong menstrual cramps. These are common with second and subsequent births, and mine lasted for several days. The midwives tucked me and baby in with blankets and set about their bustling way, in the warm golden glow of my own kitchen, preparing and tidying and setting me up for the next few days. Papi and I breathed in our baby. We called in our daughter. She hesitated in the doorway, took it all in, and gradually came up onto the bed with us as her papi encouraged her. She tentatively took in her new baby brother, touched him. My friend hugged me; I felt so blessed to have her with us to witness. My doula prepared me a snack, eggs that felt more nourishing than anything I’d ever tasted. The midwives stayed for several hours, doing their nurturing and loving work. Preparing my placenta for me to consume over the coming weeks. I felt their presence like a glowing flame in the darkness. After 45 minutes when the baby crawled up my belly looking to nurse, the midwives helped me latch him on. My body felt so tired I couldn’t lift him; legs shaky from hours of tensing, my abdominals completely blown out by the efforts. The midwives took his measurements and cut the cord as their last bit of work, finally separating baby from his other half, his twin, from inside my belly. And reporting his weight, 8 pounds, after four giant meconium poops, crediting me with pushing out at least 2-4 more ounces than that! Finally the team left and we all snuggled down to sleep, together under the blankets, our new family of four. My daughter fell deeply asleep, curled up next to her baby brother. Peace and tranquility, after the beautiful torment, the wild and raging storm, that brought my new love, my baby boy, home to my arms. Felicitaciones me párese una historia muy conmovedora y el poderlo contar después de alumbrar al niño en la casa y en componía de su querida familia felicidades, un fuerte abrazo para esos valientes esposos. Thanks for reading! For the afterpains I used the After Ease tincture from Wishgarden Herbs. I took it like every 30 mins for days, went through about 4 bottles, but it worked so much better than anything else! « Why Stop Working before the Birth?